SEOUL (Reuters) - The world's No.2 TV maker, South Korea's LG Electronics Inc, is betting that chopping prices almost in half before the U.S. year-end holiday season will create enough buzz to push its next-generation TV technology mainstream. The manufacturer and affiliate LG Display Co Ltd have invested billions of dollars in organic light-emitting diode (OLED) displays to rebuild profit decimated by Chinese competition in the liquid crystal display (LCD) TV market. OLED screens deliver better picture quality, consume less electricity and promise wider profit margins than LCDs. But many rivals including leader Samsung Electronics Co Ltd have said production was still too costly for the mass market. 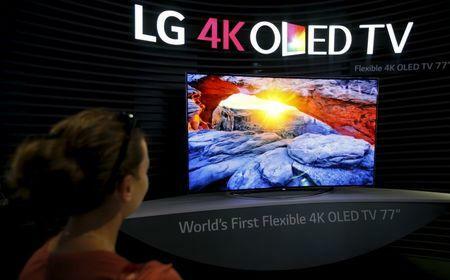 In an indication of rapid OLED development, LG Electronics said production improvements allowed it to cut prices of six models in the world's biggest TV market by as much as 45 percent from last month, without crimping margins. Two are now below $2,000, a fraction of the $14,999 of LG's first OLED TV in 2013. "This is the first time we'll be within the range of what people would consider an affordable price," Vice President Lee Jeong-seok said in a recent interview. LG is banking on OLED to raise profitability in a saturated TV market plagued by sluggish demand and shrinking margins for LCD sets. Profit at its TV division shrank 73 percent in July-September from a year earlier. OLED is currently used mainly in smartphones and wearable devices, as production becomes complex as sizes increase. But LG Display has allocated at least 10 trillion won ($8.64 billion) through 2018 mainly to develop OLED and is considering building a third manufacturing line for TV-sized OLED screens. Prospects for the technology in TVs were also boosted last month when Japan's Panasonic Corp launched its first OLED TV, in Europe, for around 10,000 euros ($10,791.00). But investors and analysts said meaningful sales volumes remain years away as the two LGs are the only global names committing significant resources to the technology. Researcher IHS said 370,000 OLED TV sets will be shipped this year, compared with 224.5 million LCD TVs. Through the U.S. price cuts, LG aims to prove the technology is ready for the mass market and primed for growth. Researcher IHS said OLED TV shipments are likely to reach 7 million sets by 2019, outpacing the 11.3 percent expansion it sees for LCD TVs. LG said U.S. sales are already growing after price cuts and promotions for OLED TVs that began on Oct. 8. It declined to provide details. Seoul-based IHS analyst Jerry Kang said while the cuts will help accelerate sales, there is room to improve production yield rates and costs to make OLED TVs more competitive. "LG is targeting the premium TV market with OLED technology while Chinese rivals are competing in the low- to mid-end market with LCD," said Kang. "This can be a viable strategy, but it should be based on enough demand."